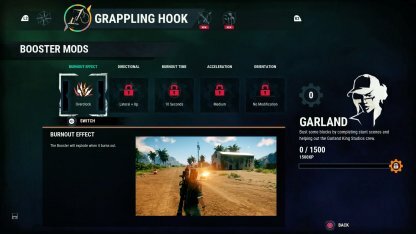 Learn all about the Gear Mods available in Just Cause 4! Included are all Gear Mods for gadgets, their requirement & how they perform! 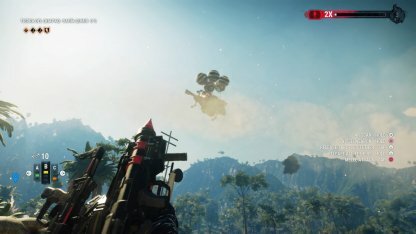 Gear Mods are unique modifiers which can dramatically change how your gadget performs. Utilizing these Gear Mods can create new opportunities for chaos and destruction in your journey! New Gear Mods can be obtained either by completing specific mission challenges given from unique NPCs. Each NPC will provide a Gear compatible only for each Upgrades (ex. Booster Gear can only be used to unlock Booster Gear Mods). Unlocking new Gear Mod will require you to use 1 unique Gear per category. 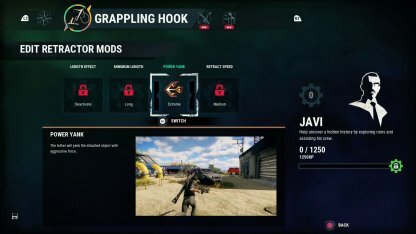 Gears required to unlocking Gear Mods are given by NPC, who have originally given you the Grappling Hook upgrade. Using the Gas Gear Mod will allow your Air Lifter to burst into flames once it's been popped. Although the explosion is not excessively large, it is enough to kick start a fire or chain explosion when used with other Tethers and objects. The Power Yank Gear Mod will give a short burst of speed when the tether retracts, pulling each target together in an jolt. You will be able to easily yank enemies off their feet and sabotage vehicles with ease with this Mod. By using this Gear Mod for the Booster, you will be able to damage the target once the booster overdrives into a fiery explosion. Use this to sabotage Chaos objects, enemy vehicles or even enemy soldiers!